Touch the button for the 35th floor of a modern skyscraper, the elevator doors whoosh gently together, and you step out, 400 feet up, 30 seconds later. 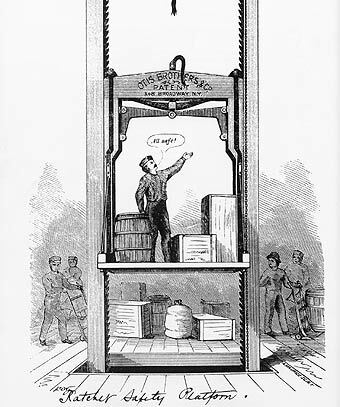 The ancestor of today’s lift hoisted up beds exactly one floor in a New York factory a little over a hundred years ago. Men have known how to hoist weights up or down with pulleys and winches since ancient times. What made the lifting platform at the New York bedstead factory significant was a vital improvement designed by its builder, Elisha Graves Otis. A safety device automatically stopped the platform crashing down if the lifting rope broke. Otis ran his own machine shop, doing odd jobs. He used the stream behind his house as a power source, but then the town took it over as part of the local water supply, so Otis had to close down. He moved his family to New York, where he was put in charge of building a new bedstead factory. The factory needed a lift, and Otis invented one with the safety device. Otis was thinking of joining the gold rush to California when he was asked to build two more of his ‘safety hoisters’ With his two sons he opened a shop in part of the bedstead factory. 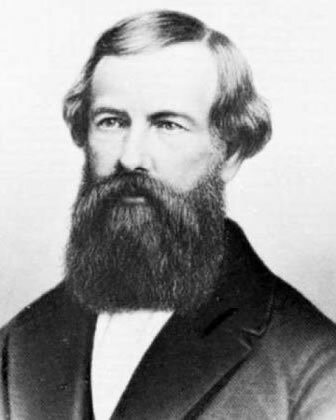 Next year, in 1854, crowds at a New York exhibition watched a remarkable demonstration of Mr Otis’s invention. Otis stood on the platform of his lift and had it hauled up to the highest point. With a flourish, the hoisting rope was cut. No crash to the death resulted; a smiling Otis stood on the platform held firm by its safety device. The lift was safe enough to carry people. Orders were still slow, so Otis manufactured several of his other inventions, like a rotary baking oven. Hotel owners were quick to see the advantages of lifts which could carry people safely. Now they could charge as much for rooms on the top floor as on the first floor – perhaps even more, if there was a view! The first practical passenger lift was installed in a New York hotel in 1859. It went up and down on a giant screw, and foreign visitors marvelled at this latest American gadget, although many hotel guests felt happier using the stairs. The first office block was equipped with a lift in 1868, and the top floor was immediately let at a large profit. Business and office buildings in big American cities now leapt up from five storeys (which were all the stairs most people could manage) to eight, ten or even twelve storeys. More people could now fit into the same ground space, so the value of building sites rose, and more people crowded into the cities.